From the John Moran Eye Center at the University of Utah, WebVision (first reported on in the August 9, 2002, NSDL Scout Report for Life Sciences) is an extensive hypertext that attempts "to summarize the recent advances in knowledge and understanding of the mammalian retina." Three newer sections have been integrated into the online textbook in recent months. A subsection on S-Potentials and Horizontal Cells was added to the Anatomy and Physiology of the Retina section, and sections on Regeneration in the Visual System of Adult Mammals, and Fetal Tissue Allografts in the Central Visual System of Rodents were added as well. The text sections include helpful diagrams and images, as well as extensive reference listings. 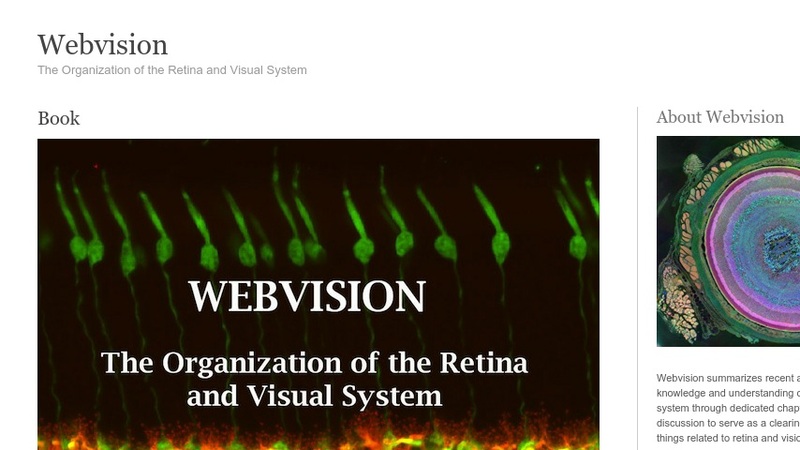 Other major sections of the WebVision hypertext include Retinal Circuits, Color Vision, Psychophysics of Vision, Primary Visual Cortex, and more.